In my last post, I mentioned that I would be making a few changes to the way I blogged to ensure I’d be able to blog more often. One of these changes will be to do more ‘photo’ orientated posts, where I won’t write much – I’ll let the photos do the talking instead. I will primarily do this for restaurant and travel posts, as I was never all that good at describing dishes anyway! This will hopefully allow me to blog more regularly whilst I’m on my ‘student’ year. Warm bread rolls – I enjoyed the french loaf (pictured above), and the mixed seed roll. Full English breakfast – tomato puree, slow poached egg, crispy bacon pieces, crispy croutons and morels. The tomato puree was an intensely tomato-ey, and absolutely delicious. Escabeche of quail, chicken liver cream, nuts and seeds. Perfectly cooked quail – need I say more? Roasted halibut, Catalan paella, sprouting broccoli and pork-ham fat. The paella.. oh, my. Absolutely delicious. Better than any paella than I have eaten in Spain, thus far anyway! Braised oxtail with carrots and mash. Don’t let the simple description of the dish fool you, for this packed a whole lot of flavour, and was a total ‘comfort food’ type dish. (Complimentary) ice cream – passionfruit ice cream and lime sorbet. The passionfruit ice cream stood out for me, as it had a perfect balance of tartness and sweetness. PBJ – a playful twist on the traditional peanut butter & jam sandwich. Peanut parfait (which tasted like frozen peanut butter! 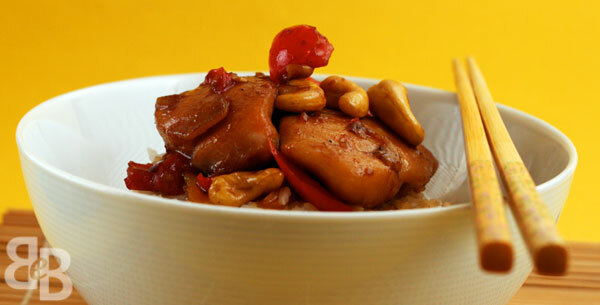 ), cherry sorbet, cheery tagiatelle, cherry halves, cherry jellies, and toasted rice puffs. One of my favourite restaurant desserts, ever. I would happily eat this over and over and over again. Tiramisu. This is one for any chocolate lover: dark chocolate mousse, chocolate shards, chocolate ‘fronds’, chocolate sand, mascarpone mousse, and kirsch jelly cubes. Served with chocolate coffee on the side (which can be drunk separately, or poured on top of the tiramisu). The ‘chocolate’ coffee. Luxurious, thick and creamy. I couldn’t actually finish this as I hit my level of chocolate overload (which is very hard to do, believe me!). – Dessert Bar – an inspired idea! EDIT: Pollen Street Social has been awarded one Michelin star, which is very well deserved! Extremely pleased for Jason Atherton and his team (and my tummy). New York: Momofuku vs Ippudo – pork buns and ramen galore! I’d heard a lot about the famous Momofuku pork buns, way before I’d even planned my trip to New York. It was just one of those things that many bloggers have attempted to make at home… which obviously meant it was something I absolutely HAD to try when I visited New York. And because we simply could not stop thinking about them, we made it a point to have some on our last day in New York. This time though, we had them at the Momofuku Milk Bar (no seats, just tables and standing areas), as I wasn’t really in the mood to queue to get seats at the Noodle Bar. For some reason, the pork belly slices served at the Milk Bar looked different from the ones in the Noodle Bar (I think the ones in the Noodle Bar had a thicker glaze) – they still tasted the same though. Fat-laden? = yes. Worth the calories? = Totally. This was one of the specials, I forgot to take take a photo of the specials board so can’t exactly remember what this was. From memory, I think this was a duck ramen dish. Whilst the broth itself was a little too salty, the buckwheat noodles were just the right consistency – springy with a slight bite to it. Momofuku ramen – pork belly, pork shoulder and poached egg. This was good (I’m a total pork fan, as you will probably guess by the end of this post), but again I felt the broth was too salty. All in all – I wasn’t bowled over by the ramen at Momofuku Noodle Bar. Nevertheless, I would still recommend trying it as their pork buns are simply amazing. The next day, it was time to try Ippudo which was another place I had heard many good things about. We met Ken (Hungry Rabbit) there for an early lunch, as Ken had warned us that the queues would get manic later on in the day. Truth be told though, queuing is not all that bad if you’ve got good company.. As long as you’re not starving or hangry, that is. It was great to finally meet Ken though, who even took the time to show us around East Village after we finished our lunch. He also brought me to Broadway Panhandler where I errr… let’s say I bought a few things there. 😉 Thanks, Ken! We started off with Shishito (fried Japanese peppers, served with a yuzu salt). I’ve been a fan of these peppers since I tried them in Barcelona a couple of years ago, and order them everytime I see them on the menu. Fried peppers are what they are – but dipping them in the yuzu salt made them something a little more special. Definitely a good alternative to edamame. Ippudo’s Hirata pork buns were next – at first glance, these looked slightly ‘mean’ as there appeared to be a lot less pork in them compared to their counterparts at Momofuku. Whilst these were good, they just weren’t as good as the Momofuku ones – although the buns are served with a spicy sauce, I felt that the sauce bordered on sweet rather than spicy. The fact there appeared to be more bun than pork was also a little disappointing. Shiromaru Chasu – The original “Tonkotsu” noodle soup topped with pork loin chashu, kikurage, menma, red pickled ginger, sesame, and scallions. Whilst their pork buns were underwhelming, their ramen was excellent. The broth was very good indeed, and had just the perfect balance of flavours. Definitely a winner. Akamaru Modern – The original “Tonkotsu” noodle soup topped with Ippudo’s secret “Umami Dama” miso paste, pork chashu, cabbage, kikurage, scallions, and fragrant garlic oil. I thought this tasted better than the Shiromaru Chasu, I suspect this was because there was a scattering of garlic oil in this. Mentaiko (spicy cod roe) over rice – one of the small dishes that came with the ramen lunch set. So… in the end, which did I think was better? The good: Amazing pork buns. Order two for yourself and don’t share. The not-so-good: The ramen broth was too salty! And the queues – they have a no reservation policy. The good: Delicious ramen, with flavoursome broth. Great ambiance and more spacious compared to the Noodle Bar. The not-so-good: Pork buns were slightly ‘meh’. And again, the queues. Definitely not a fan of these no reservation policies, sigh. There were definitely good things about each – but if I could only visit one, I’d choose Momofuku, as the pork buns are just too good to miss out on. Posted on May 14, 2011 May 14, 2011 Categories Dinner, Eating out, Lunch, New York, Noodles, Review9 Comments on New York: Momofuku vs Ippudo – pork buns and ramen galore! I can’t believe it’s 2011 already. I mean, could time pass by any more quickly? But in the spirit of healthiness, here is a fairly healthy pasta recipe. (I say fairly healthy because there is some butter and Parmesan used in the recipe.) I first saw this recipe on Jaden’s blog, was immediately taken by the simplicity of the recipe, and so bookmarked it. I have lots of bookmarked recipes, so this was left for a good period of time. But this pasta kept on popping up on the food radar, with everyone raving about how good it was. Which obviously meant that I *had* to try making it. This tomato basil spaghetti is one of the most popular dishes at New York’s Scarpetta (so I hear), and I’ve read about people who specially make a trip to Scarpetta to try this dish. And after making it, I can see why. 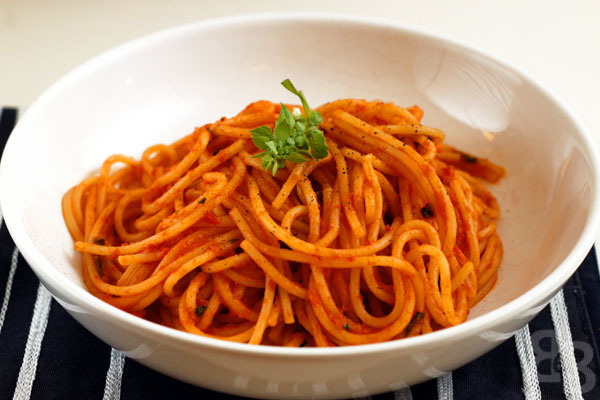 The freshness and sweetness of the tomato sauce that coats each strand of spaghetti is infinitely better than ready made pasta sauces – and when you think about how simple it is to make, it will make you want to give up on premade sauces altogether. The original recipe calls for fresh plum tomatoes, but I used a mixture of fresh and canned plum tomatoes. The quality of your tomatoes are important, as you want the freshest and sweetest tomatoes you can find (they don’t necessarily have to be plum tomatoes, I’m sure other varieties would work just as well). Quality may cost more, but trust me when I say it will be worth it when it comes to making this sauce. 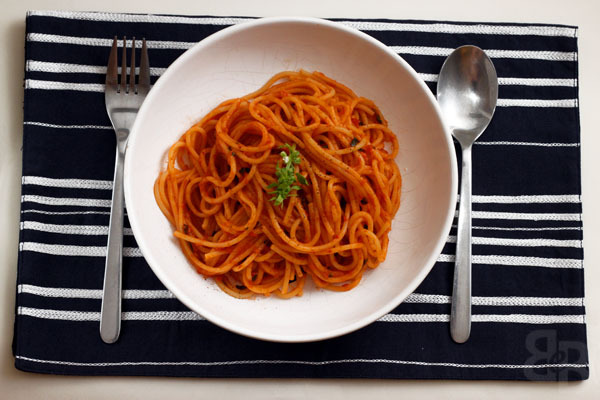 The spaghetti is served with a garlic basil oil, which in my opinion brings the dish to another level whilst not overpowering the star of the event – the tomato sauce. The oil is made by infusing garlic, fresh basil leaves and a pinch of chilli flakes in hot olive oil. I might take the “lazy” route the next time I make this, and infuse fresh basil leaves in store bought garlic olive oil (Waitrose does a fantastic one which I use everytime I don’t want to chop garlic). Plus I think that the intensity of garlic is more evident in the store bought oil – I’m a HUGE fan of garlic you see. 1. Bring a large pot of water to a boil. Have a large bowl of ice water nearby. 2. Whilst waiting for the water to come to a boil, cut a small X on the bottom of each tomato. Ease tomatoes into the pot and boil for about 15 seconds, then promptly move them to the waiting ice water. 3. Pull off the tomato skin with the tip of a knife (a normal butter knife works fine). 4. Cut the tomatoes in half and use your finger to flick out the seeds. 5. Heat olive oil in a large pan over medium high heat. Add the tomatoes (both fresh and canned) and red chilli flakes to the pan, and season with salt and pepper. It’s safer to under-season at this point, as the sauce will reduce down later. 6. Let the tomatoes cook for approximately 5 minutes, or until they become soft and mushy. 8. Cook the tomato sauce for 20-25 minutes, until it thickens. Whilst the sauce is cooking, make the garlic basil oil. 9. Put the olive oil, garlic cloves, basil leaves and pepper flakes in a small saucepan, and heat over low heat. Allow the ingredients to warm slowly to release their flavours. 10. When the garlic is lightly browned, turn off the heat, and let it cool. 11. Before using, strain the oil and discard the solids. 12. Cook the spaghetti in boiling, salted water until just shy of al dente. Drain and reserve a little pasta cooking water. 13. Add the spaghetti to the tomato sauce and cook over medium high heat, gently tossing the pasta and the sauce together with a couple of wooden spoons. (You can use tongs but this increases the risk of breaking up the wonderfully long pasta strands.) 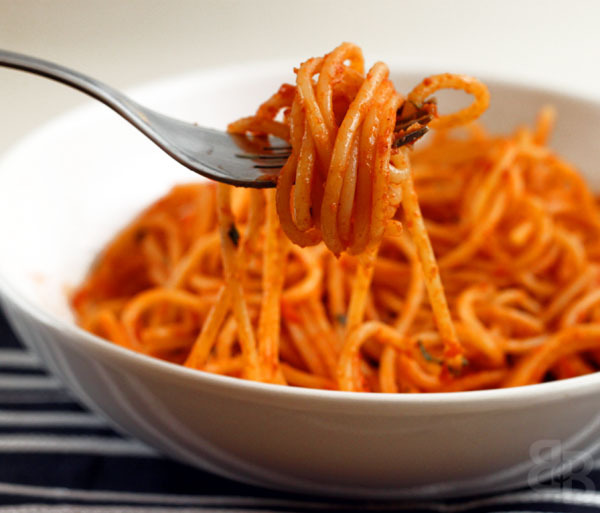 If the sauce seems too thick, add a little pasta cooking water to it to thin it down. 14. Remove pan from the heat, and toss with the butter, basil and Parmesan. 15. 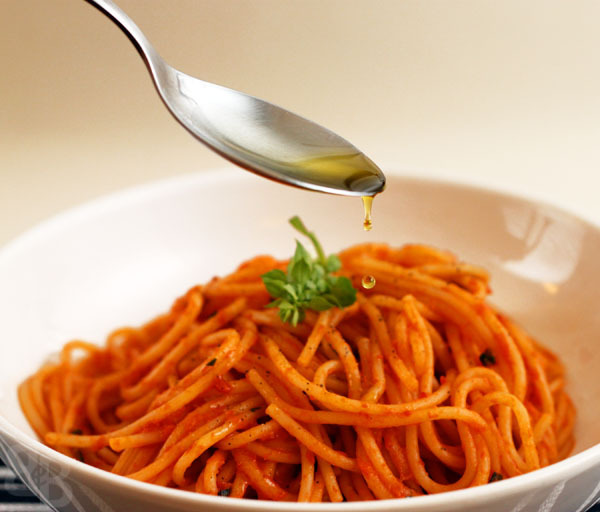 Serve the spaghetti into plates, drizzle with the garlic basil oil, and serve! 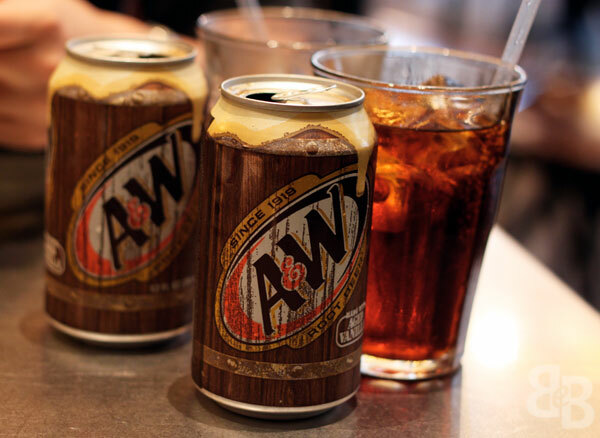 Byron: Hamburgers and A&W root beer floats! 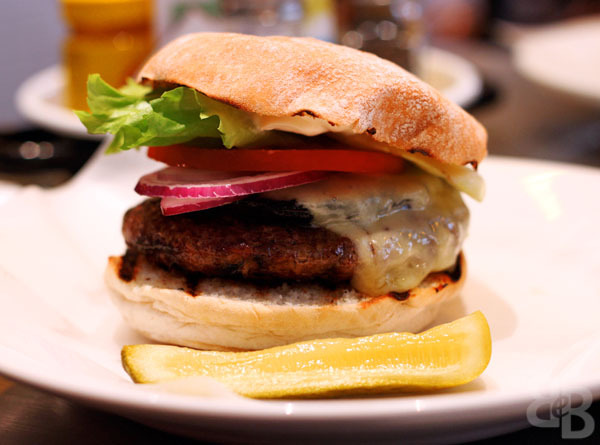 Everyone loves a good burger. I mean, how could one resist freshly toasted buttery buns, sandwiched with a delicious hunk of meat (or even vegetables!) and finished off with lots of melted cheese? Pure heaven. In fact, I’m such a burger lover that I even make my own from time to time. But you know what, making everything from scratch takes time. The burger buns themselves take a good few hours as they need time to rise and proof and all that. And that’s clearly not going to work if you have a sudden burger craving at six in the evening. Enter Byron. They pride themselves on serving “proper” hamburgers. They have a few main principles that they stick to: “good beef”, “freshly made”, “cooked medium” and “proper buns”. The beef is sourced from small farms in the Scottish Highlands, and this beef is made into patties each morning by the Byron chefs. And you know what, it shows. 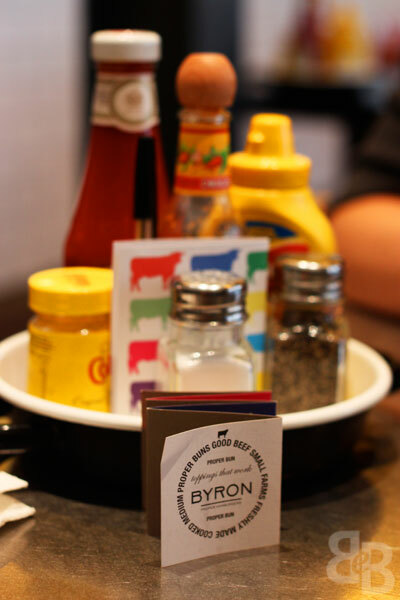 When you bite into a Byron burger, you know that it’s good beef. The main event is of course, the burger itself. 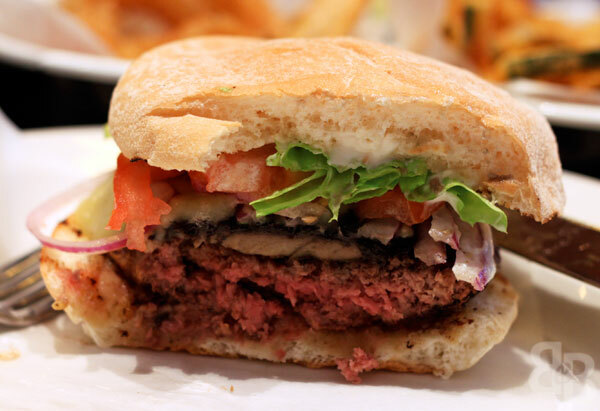 There are 6 burger options: Classic (6oz hamburger), Cheese, Byron (bacon, cheddar & Byron sauce), Skinny (bun free, with a salad on the side), Chicken fillet and Veggie (grilled Portobello mushroom, roast red pepper, goat’s cheese, aioli, and baby spinach). There’s also an option for a double patty, which I’ve never had because I honestly do not think that I could finish it all. I tend to order either the Cheese or the Byron, with an extra slice of cheese and a Portebello mushroom. 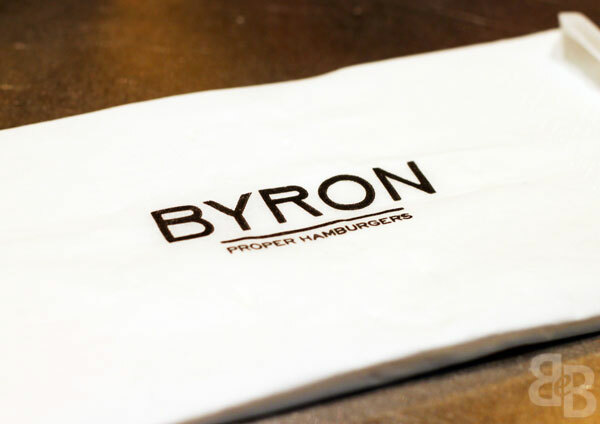 The burgers range from £6.25 for the Classic to £8.50 for the Byron, and additional toppings cost £1.50 each. As you can see, the meat is cooked medium – you get a beautiful flash of pink when you cut into the burger, just how I like it. I’m not sure if they ever serve up well done burgers, but I’m sure they could do so if you prefer your meat less pink. 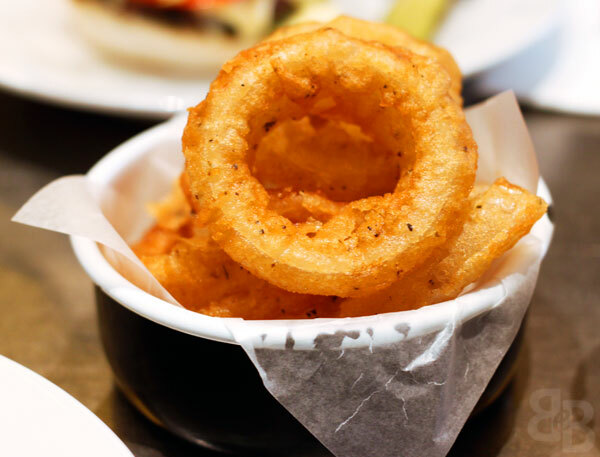 Not only do they do great burgers, but they also do fantastic sides. 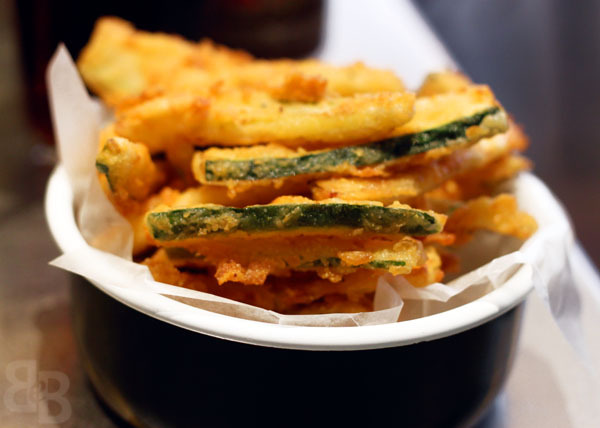 These courgette fries (£3.00) are my staple side order everytime I’m at Byron. Lightly battered and deep fried – yum. Of course, I’m not going to say that this is healthy (because let’s face it, it’s deep fried), but at least it’s still part of your 5-a-day. My only whinge is that it’s sometimes very greasy, especially when you get right to the bottom of the bowl. You get a selection of sauces to go with your burger and sides – mustard (both French and English), tomato ketchup, and hot sauce. I love using a mix of ketchup and mustard, there’s just something about the sweet & spicy mix that just works so well! 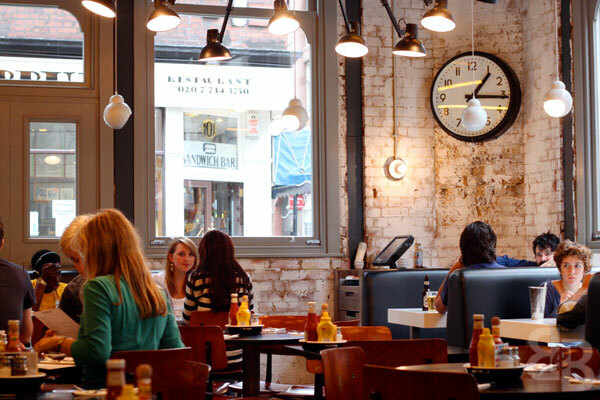 * They also have branches in Covent Garden, Islington, Canary Wharf, Kings Road, White City and Gloucester Road. Posted on October 17, 2010 Categories Beef, Dinner, Eating out, London, Lunch, Review16 Comments on Byron: Hamburgers and A&W root beer floats! I was one of those children who hated vegetables. I still remember how I would only eat a very small group of vegetables: beans, beansprouts, carrots and cauliflower. No leafy greens ever made it onto my plate. Surprisingly, my mum would never force me to eat them – she would offer them to me, and if I said no, that was it. Turns out my mum hated vegetables when she was a child, but then grew up to love them… and she figured that I would be the same. And how right she was! But why am I telling you this seemingly unrelated story of my childhood? Well, because of this dish. Beef and broccoli noodles to be exact. Broccoli was one of the major “no no’s” in the younger me, but is now something I eat on a regular basis. When cooked well, broccoli tastes absolutely amazing. But overcook it and you end up with a pile of green mush that no vege lover in the world would want to eat. I tend to cook my broccoli the “Heston” way – see this article for more details. The broccoli is cooked in minimal amounts of hot smoking oil, and then covered with a pot cover to allow steam to build up and cook it all the way through. 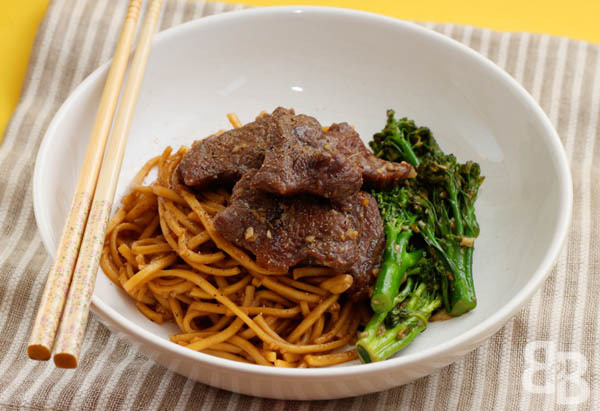 I like his method because it not only tastes a lot nicer, but also means you retain the nutrients within the broccoli (which you lose via boiling). 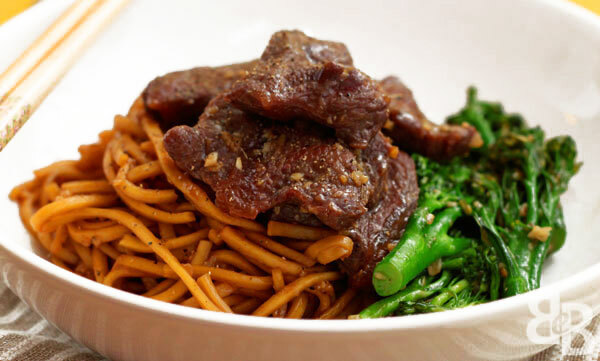 This beef and broccoli noodle dish is inspired by this recipe from Steamy Kitchen. Sometimes you see a photo of a dish, and you immediately know you *must* try it because you know it will be amazingly delicious. The first time I saw the photo for this dish on Jaden’s blog: that was one of these moments. And I was right, because this is so so good. 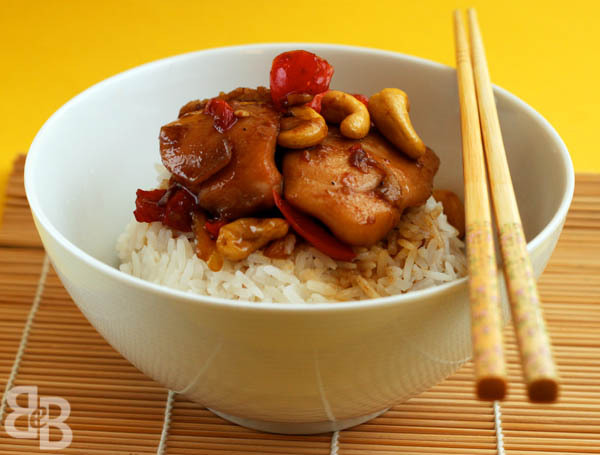 On another note, I challenge you to look at Jaden’s photos of this dish and NOT want to lick your screen. I assure you it is quite impossible. My photos look so amateurish compared to hers! Oh well. I didn’t follow the exact recipe because, well – that’s me. Instead of using stock in the sauce making process, I add extra oyster sauce/rice wine/soy sauce to make up for it. I also use lots of black pepper because I enjoy the extra kick it provides. 1. 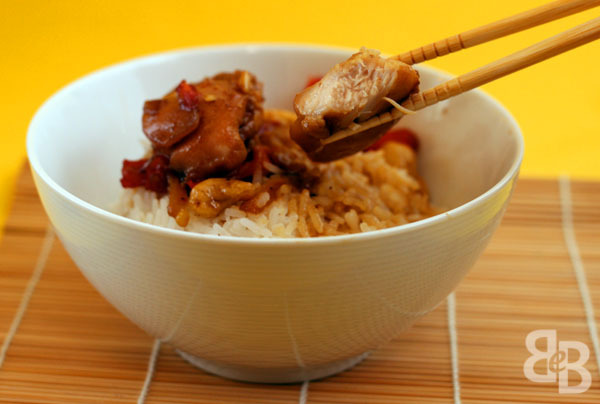 Combine 1 tablespoon each of soy sauce, oyster sauce and rice wine in a medium bowl. Add the sugar and mix until completely dissolved. Add the sesame oil and beef, and mix well. Marinate for 20 minutes. Drain and discard the excess marinade. 2. Bring a large pot of water to a boil. Cook the noodles until 1 minute shy of being done, and drain. 3. Heat 1 tablespoon of the vegetable oil in a pan or wok over high heat, and stir-fry the garlic until fragrant, about 15 seconds. 4. 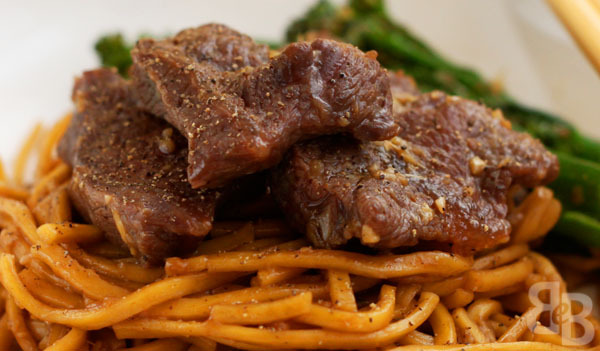 Add the beef to the pan and stir-fry until tender, 3-4 minutes. Remove onto a plate and set aside. 6. Add the remaining soy sauce, oyster sauce and rice wine to the pan. 7. Add the noodles, and stir to ensure the noodles are coated with the sauce. Cook for 1-2 minutes until most of liquid is absorbed. 8. 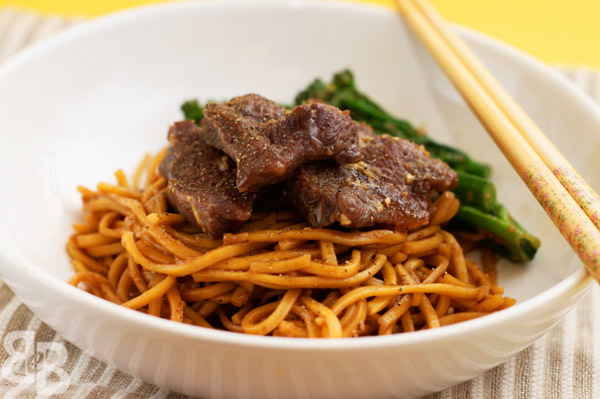 Return the beef to the pan, mix with the noodles and broccoli. 9. Season with freshly ground black pepper (to taste), and serve.